Charlies Soaps are formulated to safely and effectively clean fabrics and surfaces without the use of harsh chemicals, dyes, phosphates, UV brighteners or perfumes. Hypoallergenic, non-toxic and completely bio-degradable, will neutralize and remove stains and odors with a unique blend of coconut-based detergents and natural washing soda. Charlies soaps are non-irritating, environmentally safe and formulated to clean and brighten a wide range of fabrics and household items. Charlies amazingly powerful laundry liquid is non-toxic, hypoallergenic and especially recommended for those with sensitive skin. Strong enough to remove embedded odors and stains from high-tech microfiber, athletic and waterproof gear, it is also gentle and effective for laundering silk and other delicate fabrics, as well as linen, wool , cotton, bamboo , hemp and other natural fibers. Works great for diapers! Originally designed for use in textile quality-control laboratories, Charlie's liquid soap is (HE) compatible, septic safe and guaranteed not to fade colors or leave behind detergent residue. Laboratory tested for 100% rinsability and effectiveness. Use just 1 oz. per large wash load. Charlies Soap Laundry Powder uses just 1 tablespoon per large wash load and includes all the properties of our liquid laundry soap in a concentrated formula. One 2.64 pound bag of laundry powder safely and effectively wash up to 100 full loads of laundry. Charlies Laundry Powder is perfect for those with skin sensitivities and allergies as well as babies. Utilizing natural Green River washing soda from Wyoming, this unique formula is water soluble and made with a unique blend of biodegradable coconut-based detergents. Completely non-toxic, washing soda has been used for thousands of years to clean and brighten fabrics without causing either skin irritation or environmental damage. Charlies Indoor/Outdoor Cleaner is a safe and effective multi-surface cleaner that was developed as a non-toxic, biodegradable industrial cleaner. Now available to the consumer, this unique formula gently removes grease and grime, without harsh abrasives or additives. Perfect for situations where cleanliness and safety are of utmost importance, this all purpose cleaning agent does not blast stains but safely removes them with concentrated application. Capable of removing even pitch and tar from machinery, hands and tools, Charlies Indoor/Outdoor Cleaner is excellent for cleaning carpets, rugs and upholstery without fading or damaging colors and fibers. 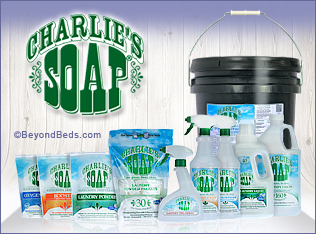 Charlie's Indoor/Outdoor Cleaner is a very efficient cleaner and a little will go a long way. For most jobs, it is best to dilute the Indoor/Outdoor Cleaner with water. Indoor/Outdoor Cleaner Sizes: 32 oz Sprayer, 1 gallon jug, 5 gallon bucket. Use full strength on: bicycles, showers, tubs and sinks, tires, etc. Use half strength on: counter tops, stove tops, appliances, scuffs on floors, walls, etc. Cars, trucks, boats etc: 1 cup of Charlie's Indoor/Outdoor Cleaner to a 5 gallon bucket of water. Charlie's Indoor/Outdoor Cleaner is approved by the USDA for use in federally inspected meat processing plants and on all surfaces for food processing and preparation equipment.